Vikas Sharma, at present, is working in Adani Port as a Security Assistant in Adani Security Wing at Gujarat with a monthly salary of Rs 15000/- per month. However, life in the beginning was not same like he has now. Vikas belong to a very poor family from Sainth village in Akhnoor Tehsil, Jammu. His father, Joginder Sharma is a farmer and was the only earning member in the family. Vikas and his whole family depended on whatever meager amount his father could earn from the agriculture they have. Gradually, with the strain in the financial income he had to give his studies and was looking out for a job to help his father. It was during the days of search when he came across Don Bosco Tech and learned about the free training they provided to youth like him. He let no time to waste and got enrolled the very next day after he successfully insisted his parents to let him take the training. 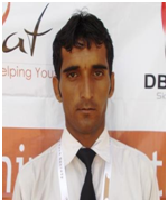 With lots of hope and faith, he joined Don Bosco Tech centre at Jourian as a BPO trainee. During the initial days, Vikas struggled to catch the training program and brush his skills for his benefits. The struggle he came across was taken as a challenge which he overcomes at the end of the three month training. He came out with a flying color and positive changes in his behavior and attitude. After the training, he got a campus placement in a BPO called Competent Synergies Pvt Ltd as a Customer Care Executive with a salary of Rs. 4000 per month. As he felt that he needs to grow more in his career, he joined Reliance Call Center as a CSR and later promoted to Senior CSR. At present he is working as a Security Assistant in Adani Port. He is very happy and contented with his job. Appreciating the humanitarian work of Don Bosco Tech he says, “I am able to earn my livelihood and help to my family now. This all happened because Don Bosco Tech came into my life. I would like to thanks the centre, my trainers and MoRD for giving me this opportunity and to carve out a way to a better future for me and my family.